Shells, etc. was an entry in the Folly/Function 2018: Seats Competition. 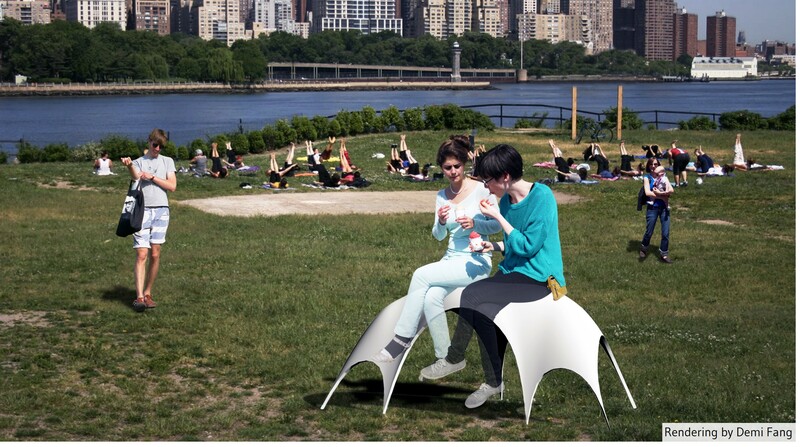 The objective of the competition was to provide seating at Socrates Sculpture Park. Shells, etc. features a set of form-found stools and benches. Fabric is pinned and hung. Funicular forms emerge and wet concrete is applied. The concrete cures and the forms are flipped. Each stool and bench while generated with the same process is unique. The variations in these forms can range from subtle to extreme through manipulation of the fabric’s stiffness and initial shape as well as the number and locations of pins. Featuring a series of natural curves, the thin shell stools and benches provide opportunities for relaxation and play.